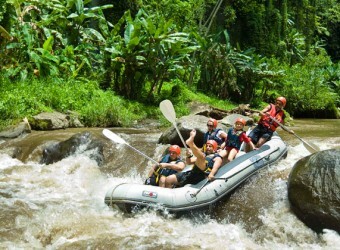 Let's explore the Bali jungle's river ! 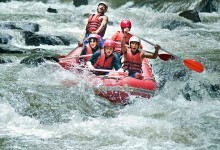 You like Ayung river ? 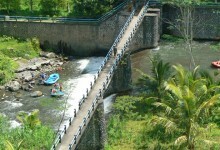 or Telagawaja river ? 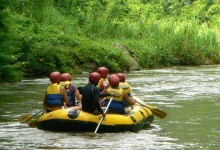 Ayung River flows through north of ubud and an unhurried calm flow is a characteristic. It go down by the boat all way, no detour of walking. 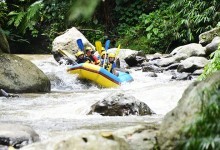 The scenery along the river is tropical trees grow thick and the right tropical jungle. Pass the many waterfalls on the way. You can watch the wild monkey and colorful birds lucky. Because there is no big drop, even child can enjoy it. 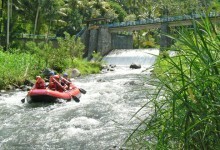 Telegawaja River flows through the foot of holy Mt.Agung, and clear water and high speed of the flow are characteristics. In the Dry season(from April to October) sometime the volume of water drop, and company except SOBEK must to get out boat and detour on walk along the way. There is the drop point sliding down about 4m. 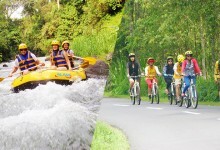 If you want to feel full of thrill, let's go to Telagawaja ! Mostly cae you will share with other customers. Also, transport car will stop by each pick up area, so your time schedule might change littlebit. Please wear clothes which may get wet from head to foot. 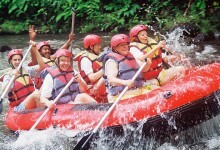 While Rafting, you would pour water over allbody. There are few swimming point, too. Most of our gest wearing Sport wear or T-shirt in the tops, and short pants or half pants in the bottoms. It is recommend wear swimsuit inside,too. Do i need change clothes for all? Yes, You will get all. 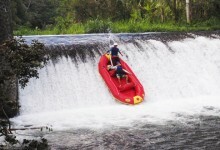 You can use rental towel by activity company. Please bring make up item for womens. I haven't sandals which stopping heel part? If you don't wearing sandals not stop heal or beach sandal, you can participate. But those sandals may put off when your boat shakes or swimming. Please be careful. In addition, some souvenir shop near start point selling sandals which can stop the heel. What kind of scenery can you watch? The jungle along the river, colorful bird and monkey, Hindu temple, more than 10 waterfalls, rice terrace and Balinese people. How about when it rained ? 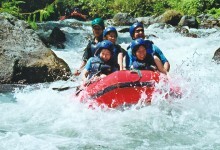 You can enjoy Rafting without problem unless the volume of water exceeds the dangerous level.